Put a stop to eyeglasses that slide down. 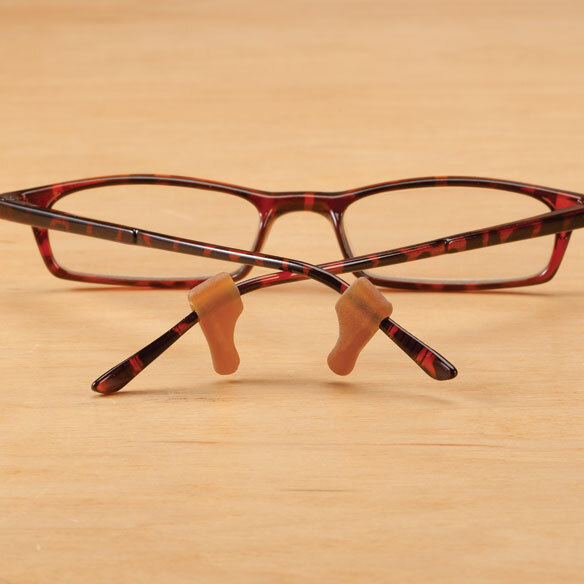 Lightweight, comfortable Ear Loks eyeglass ear grips slip on your glasses to secure earpieces in place and adjust in seconds for the perfect fit. Provide a custom fit for any eyeglasses. Perfect for gardening, reading and more. Includes 3 pairs of 100% rubber eyeglass ear pads. Easy-stretch design fits most eyeglasses. Easy to slip on and very comfortable to wear. you can adjust to your comfort. Really works well in the summer when glasses usually kep slipping down your nose. I finally have gotten rid of those eyeglass chains. They only kept me from losing my glasses when they fell off my face. With Ear Loks I don't have that problem anymore. They're comfortable and you don't even know they're there. I love, love, love them. I'm ordinary more for friends. Hope these will help keep glasses from sliding down my nose all the time. I hope they stop my new glasses from sliding. My glasses keep sliding down my nose and I can't see well. If they stayed in place, my vision would improve and reading would be easier. When my husband is working in the yard and it's hot, his glasses keep falling off. We hope that these will stop that. My husband has difficulty with his glasses slipping. I am hoping this will help. My glasses are always slipping off while i am cooking or leaning over to fix something. Between perspiration and oily bridge of nose, my glasses are always slipping. Use lanyard style retainers, but looking for something I can leave on continually and less obtrusive. Very good for keeping eyeglasses secure on face. Hopefully to try to be able to walk without extreme pain and get something hold my glasses in place. I need them to help keep my glasses in place without constantly pushing them up to my face. Have trouble keeping glasses on. My sunglasses are always slipping down -- hope this works! Have never tried these. I'm tired of me glasses slipping so thought I'd try them. to see if this helps my glasses stay in place. I've has my glasses adjusted several times and they still slide down my nose. Thought I would give these a try. These are great. I purchased a three pack a couple of months ago. I'm still using the first pair but will change them soon. They are getting a little soft but are still good. I won't throw them out, they'll probably get harder sitting in my drawer. I bought another package just to have in case they get sold out. I would buy one pair for this price but I'm getting three. I'm tired of my glasses sliding down my nose. My tight ear is sore from the glasses rubbing it all the time. See if it holds my glasses and goggles. From slipping. glasses very hard to adjust. Temple pieces always too short. Hoping these will help instead of having to get adjustments regularly. I have trouble with all types of glasses sliding down my nose. glasses slip down on nose. To hold my glasses in place. To keep my glasses from sliding down my nose. I hope they will help keep my glass on my noises. My friend's glasses are always slipping down his nose so I thought this might help! Interested to see if they really work. Because I wear glasses that keep sliding. Because my glasses keep slipping down no matter whether I tighten the screws or not. the glasses digs into my nose, and causes a big sore on the bridge of nose, are there pads? They worked well for my problem. They are not pads. if I were you I'd ask my eye doctor. They can fix most snything. The caption says they're made of "100% Rubber." Does that mean "LATEX"? I'm allergic to latex; it gives me a rash. Other than that, they could be useful for stopping my strong, heavy lenses from making my glasses slide down. BEST ANSWER: Thank you for your question. 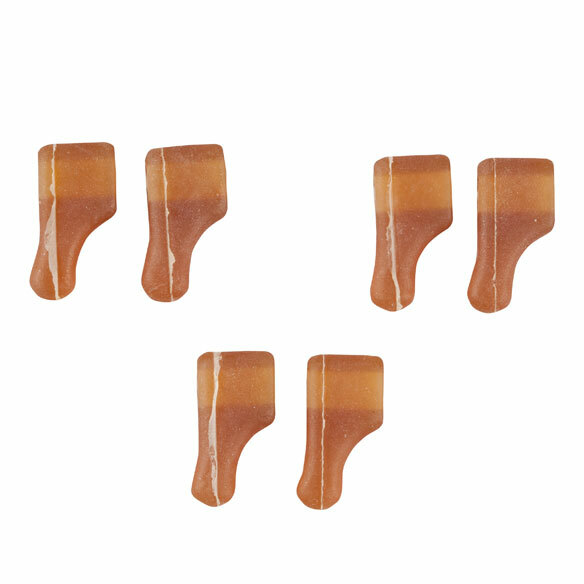 This part is made from natural rubber which is made from coagulated latex. Parts of the latex are removed in this process (proteins, moisture, various acids, etc.). We hope this information will be of help to you.